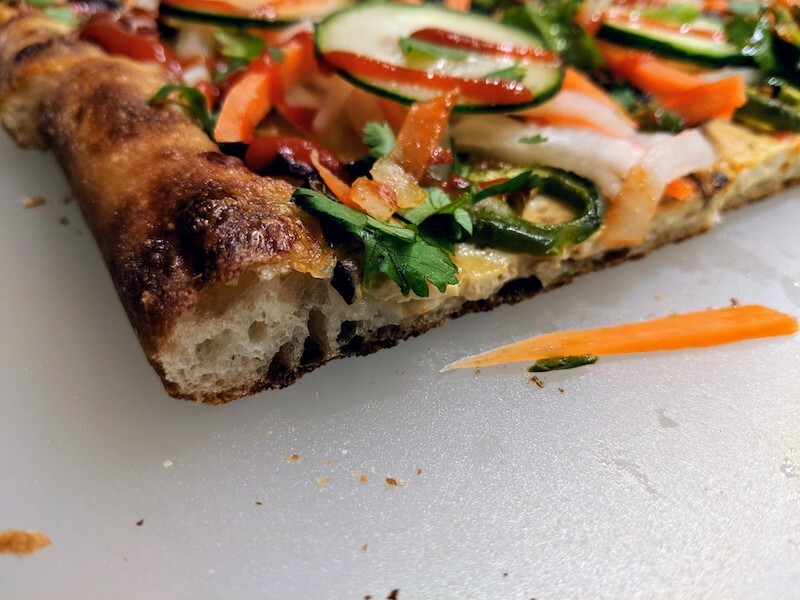 While a home chef may desire to make any style of pizza in their home oven, the truth is that there are certain styles more suited for a home oven than others. When I was in Rome, I fell in love with Pizza al taglio. The airy and crunchy crust was a nice contrast to the plethora of Neapolitan pizza I had been eating. So flash forward to yesterday and I decided to see if I could replicate this in my home oven. Spoiler: it’s doable and delicious. If you need to adjust the size of the pizza or any other dimensions, you can tweak them with my Pizza Dough Calculator. Mix and bring together. It’ll be really wet so don’t worry if the dough sticks to your fingers. Once you bring it together, you can cover it with plastic wrap and let it rest for 30 min. It’ll be a little easier to work with now and knead the dough until it becomes smooth. Put the dough in a lightly oiled bowl and let it rest covered on the counter for 24 hours. Before starting, place the pizza stone on the middle rack of the oven and place the other rack below it. This will allow the stone to cook the top of the pizza. If you only have one, then place it on the bottom rack. Set the oven to its highest temp (usually 500F) and let it heat up for about an hour. When the oven is ready, pour the dough out on to a floured surface and shape into a rectangular shape. Be gentle with the dough since it will be full of air and you don’t want to lose any of it. Transfer it into your pan and stretch the dough to the edges. Top with the mayo+soy sauce, cheese, tofu/meat, and jalapeños and place on the lowest rack in the oven for 15 minutes. Half way through turn the pan. At 15 minutes, move the pan on to the baking stone and turn on the broiler for 1 min to give the top of the pizza an additional touch of heat. Once cooked to your preference, you can take the pan out, remove the pizza and place it on a wire rack. 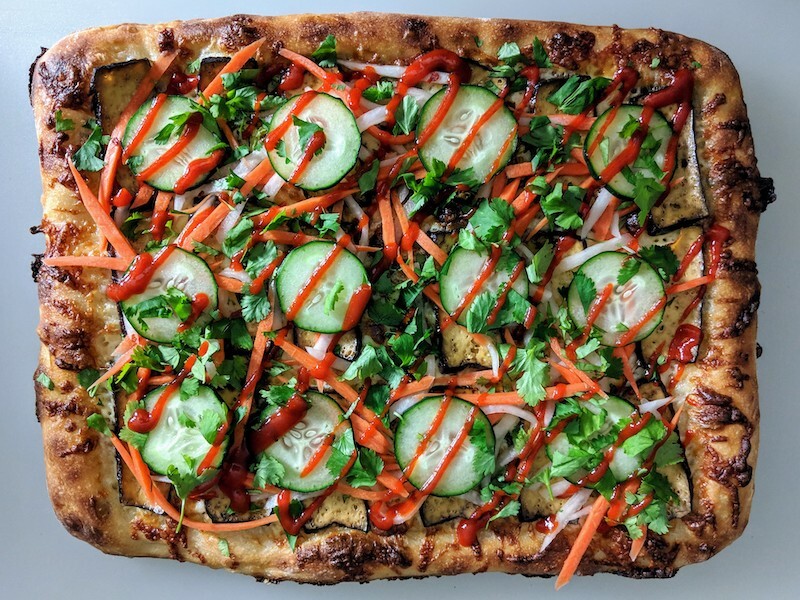 Let it cool for a few minutes and then top with the pickled veggies, cucumbers, cilantro, and sriracha.